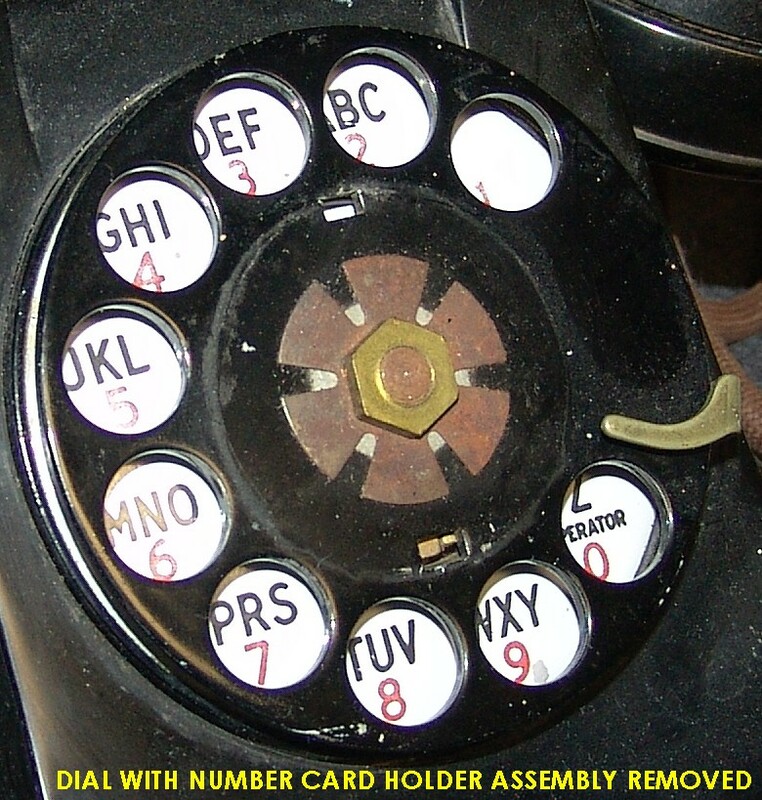 We've had several visitors to the web site ask how to remove the finger-wheel on a rotary dial telephone they just bought on eBay, thrift store, flea market, garage sale, etc. Well, I hope to provide some help in this area of telephone collecting/restoration with a little help from my friends in the two clubs I belong to. Even though touch-tone telephones became available in the mid 1960's, rotary dial phones were still in common use in the 1980's and some die-hards are still using rotary dial phones (like us collectors!) in the second millennium! 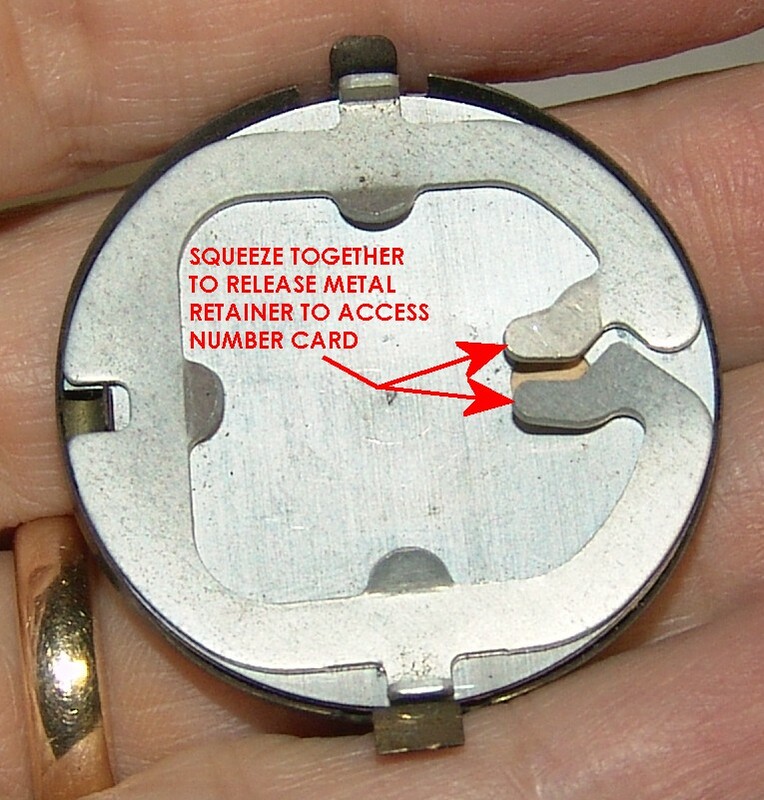 Photo of finger wheel upside down to show details of notch and "retainer tab ramp" which is what the tab slides along just prior to latching in position in the notch when finger wheel is re-installed. 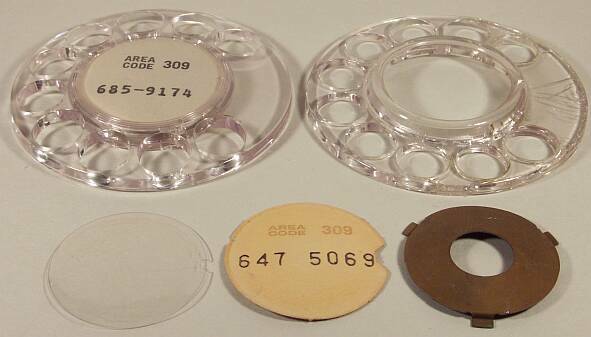 We have scans of the front and back of one type of metal number-card retainer on a model 500 set. Another photo of dials that might be of interest. 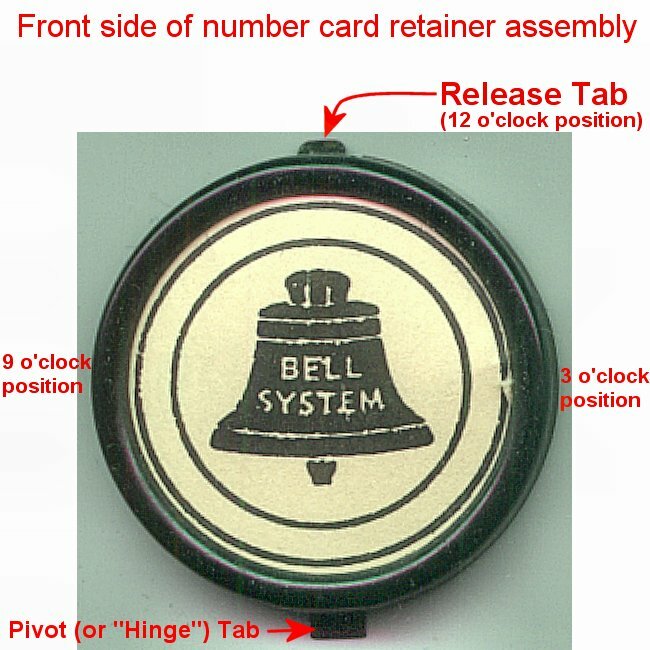 We have some photos and direct scans of various dials (mostly Western Electric). 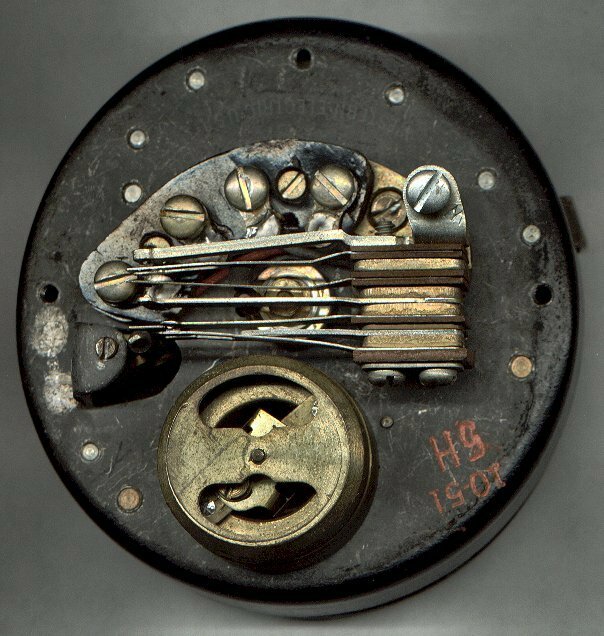 "Dials used on the Western Electric 500 and 554 series were originally #7, later #9 and finally #9xA. #7 has a die-cast frame and metal gears. Number plate is attached with screws. Metal finger wheels on black dials, plastic on colored ones. #6 dial is a 3" dial for pre-500 sets using similar construction to a #7 dial. They were used in some 5302 sets but that's not really a 500 set. #9 has a stamped frame and some or perhaps all plastic gears. 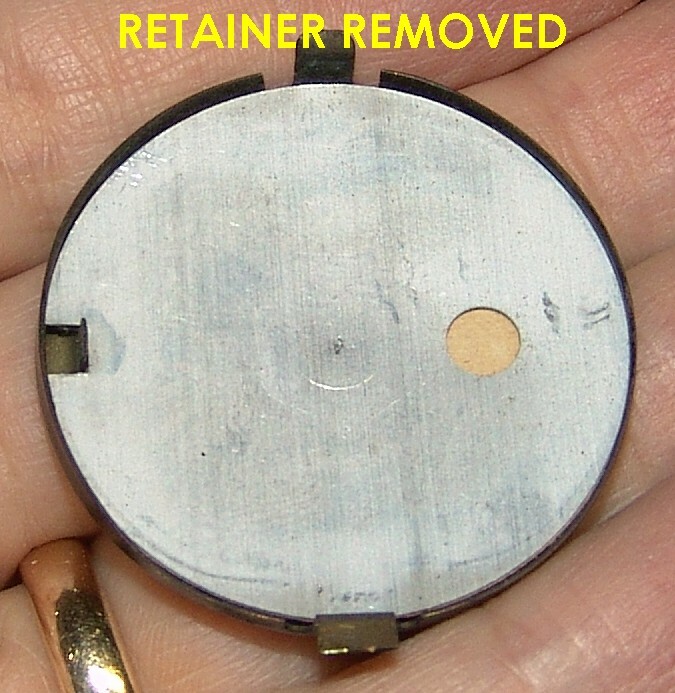 # plate attached with a locking ring. Plastic finger wheels on all color dials as far as I know. #9xA has even more plastic parts. # plate locks on by rotation and is held by the finger stop. Plastic finger wheels on all color dials as far as I know. By the way, the 9xA number plate is a retrofit for #7 dials. The #9 number plate fits the #9 only. 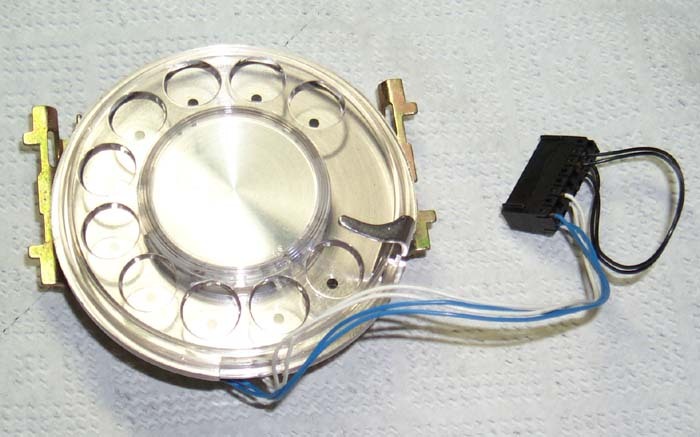 Most 500-series set dials have 4 wires. Those intended for telephone sets with speakerphones have 6 wires." 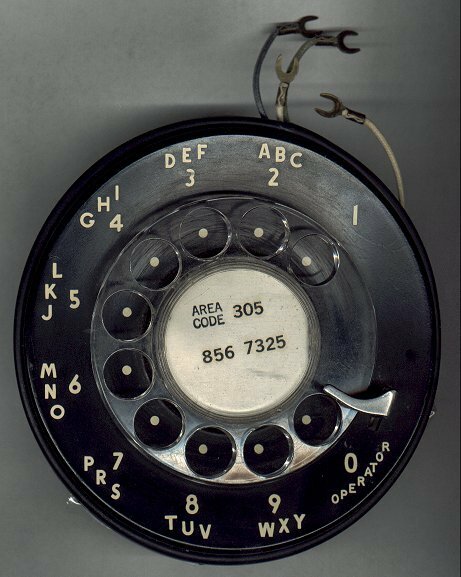 The simplest rotary dials have only two sets of contacts; one set generates the dial pulse, the other set mutes the receiver in the handset so that the load popping sounds created by the dial pulsing contacts will not hurt the users ears. 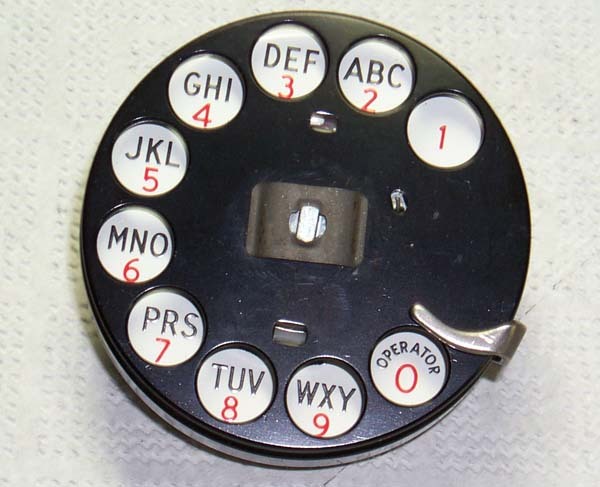 In other dials, such as the 5H series used in the Western Electric 302 telephones, there is a third set of contacts. What is this third set used for on the 5H dial?